Caption: Growing Up NYC was created to display on all electronic devices, including mobile phones, tablets, laptops, and desktop computers. Growing Up NYC (nyc.gov/growingupnyc) is a first of its kind mobile-first resource that connects families to City and community benefits and resources. 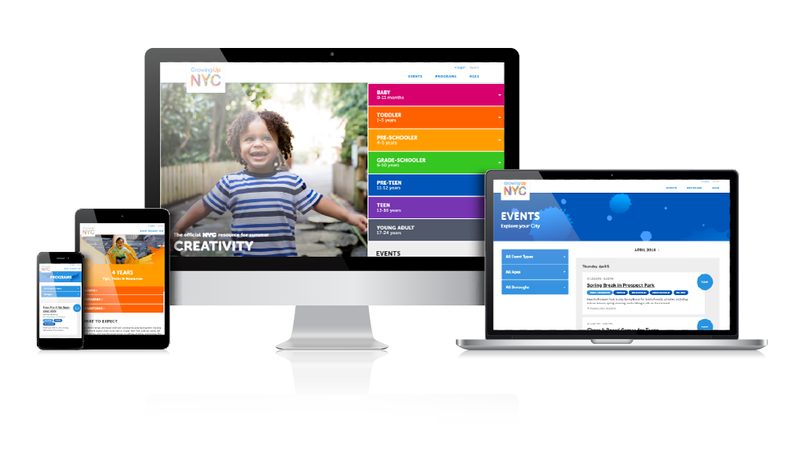 Launched in 2016, the site is part of a three-component initiative from the NYC Children's Cabinet and also includes a policy framework and printed resource guide. 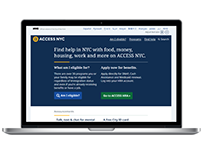 Through Growing Up NYC, we partner with numerous government agencies and community organizations to get their resources, which are not easily accessible and might have gone unused, into the hands of City residents. Caption: A Growing Up NYC promotional video was created to share across YouTube, social media, and to play in NYC taxis. Parents and caregivers now have a one-stop, comprehensive resource to help them get the most from their City government. Caption: Growing Up NYC is fully mobile-responsive, making it easy for parents and caregivers to use on the go. 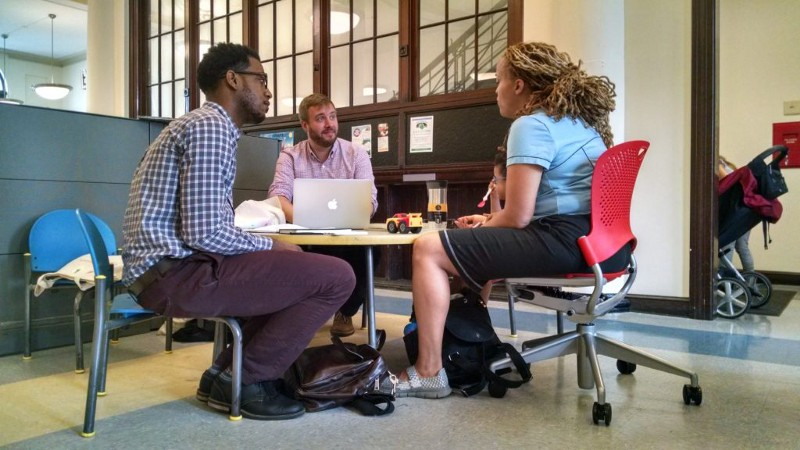 Caption: NYC Opportunity and Blue State Digital team members talking to a parent to inform Growing Up NYC. Our partners at Blue State Digital provided design and website development services. Adobe Illustrator and Photoshop were used for layout, color palette, screen mockups and asset creation. Caption: Generation NYC was created to display on all electronic devices, including mobile phones, tablets, laptops, and desktops. 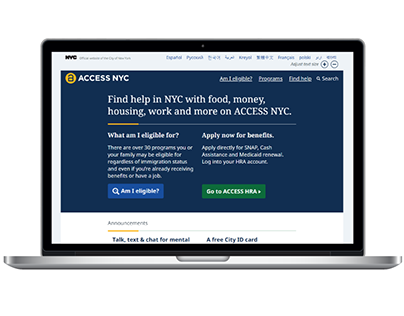 Following the success of Growing Up NYC, we built a companion website for teens and young adults, who as they became more independent would themselves benefit from more accessible information. More than 100 young people representing a cross-section of New Yorkers, including LGBTQI youth, co-designed Generation NYC (www.nyc.gov/generationnyc). Caption: NYC Opportunity designer leads a card sorting exercise with teens for Generation NYC content development. 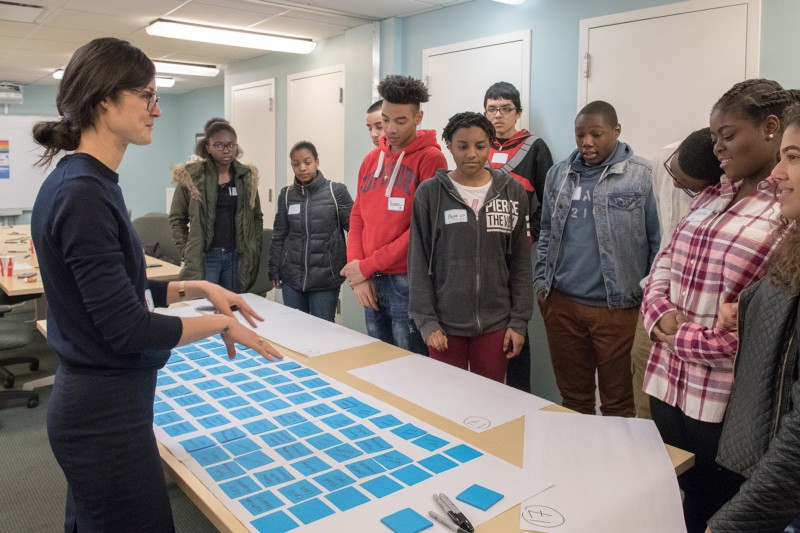 We worked with our City and community partners to see what resources are available to address the needs identified through our research, and we developed and designed prototypes to test with youth. The new content includes topics (health, college access, budgeting, etc), inspiring youth profiles, and information about free trips in NYC. Generation NYC has its own look and feel that resonates more with teens and young adults. Caption: Teens and young adults can use Generation NYC on any device from a computer at school, a tablet at home, or on their phone. Caption: A Generation NYC promotional video was created to share across YouTube, social media, and to play in NYC taxis. 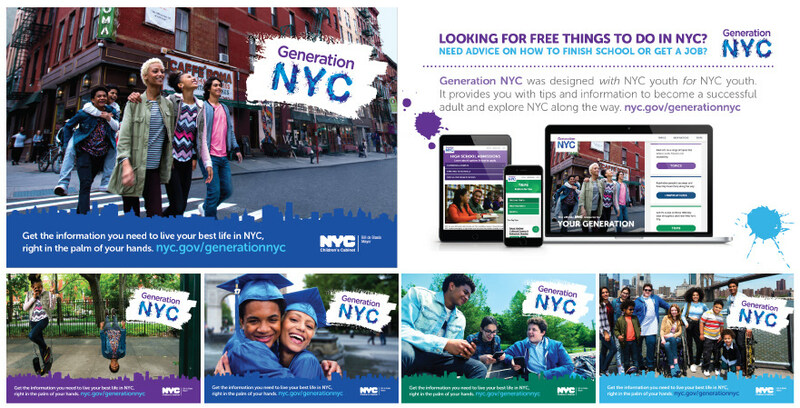 The Mayor’s Office worked with Bandujo Advertising + Design to create the branding for the Growing Up NYC and Generation NYC campaigns, design of the policy framework, and printed resource guide using Adobe Illustrator and InDesign. Caption: The Growing Up NYC Policy Framework supports the cognitive, social-emotional, and physical development of all New York City children by shaping City policies, agency practices and program development. 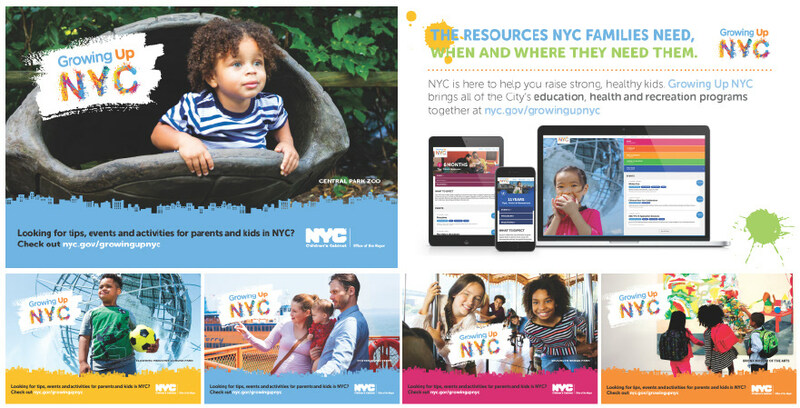 Caption: The Growing Up NYC Resource Guidebook highlights programs that support the healthy development of children and youth, and their families. It complements the City of New York’s new Growing Up NYC digital tool and has been distributed at schools, libraries, and events. The NYC Opportunity team continues use the brand guidelines to create e-newsletters, print materials, swag (such as t-shirts and totes), social media digital assets, icons, and new website features. 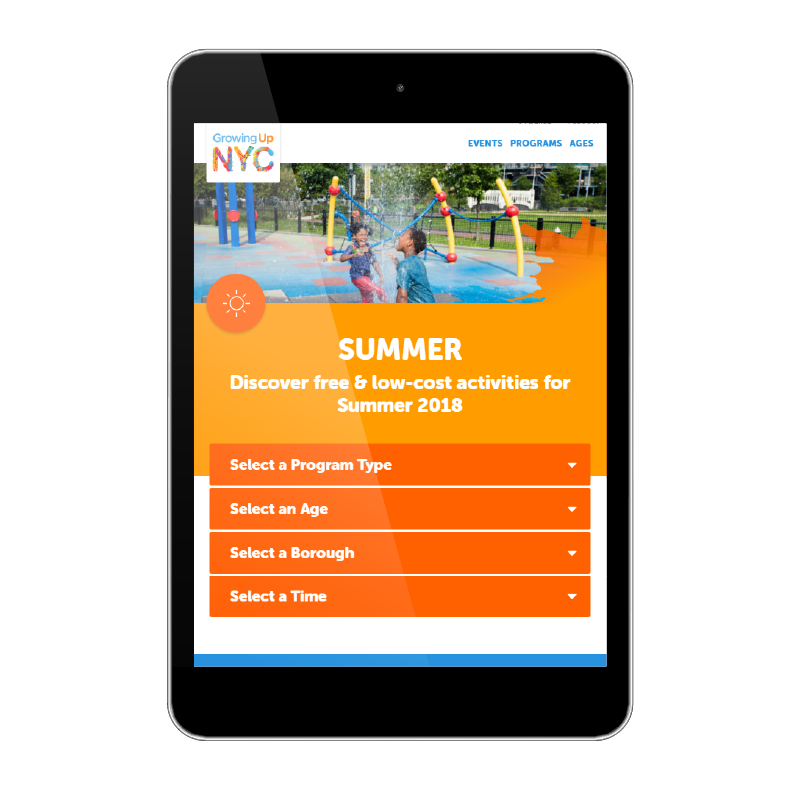 Some of these new features include the Growing Up NYC Summer Guide (on.nyc.gov/summer ), a resource for low-income parents to find free and low-cost summer programs, events, and camps across New York City. Caption: Welcome page for Growing Up NYC Summer Guide helps find the best summer fun for New York City kids. 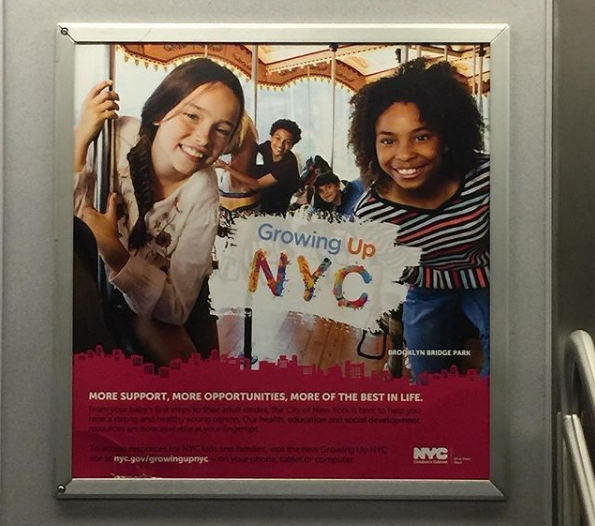 Caption: A Growing Up NYC ad featured on the subway. Caption: The Growing Up NYC and Generation NYC palm cards provide an easy in-person outreach tool to hand out at events and provide in City and nonprofit offices. The Mayor’s Office uses a suite of digital marketing tools including paid and organic social media and emails to reach new and returning audiences. We are currently partnering with City agencies to help identify and promote the websites to the New Yorkers most in need of these services. Caption: Growing Up NYC promotes special needs programming on the site during Autism Awareness Month. Caption: Getting teens and young adults civically engaged is important to our team. On Generation NYC we let them know how to vote and participate in local programs. Caption: Growing Up NYC launched a Summer Guide which free and low-cost summer programming for kids and teens across the City. Caption: Growing Up NYC e-newsletter delivers the latest programs and events directly to parents and caregivers inboxes every month. The Mayor’s Office hosted parents and caregivers at City Hall to launch Growing Up NYC in the fall of 2016. Teens and young adults joined in at the Brooklyn Academy of Music (BAM) for the launch of Generation NYC in the winter of 2018. The NYC Opportunity team attends resource fairs and conducts demos of the websites across City agencies and nonprofits. Caption: NYC Opportunity Training and Outreach Specialist works with local parent and child to demonstrate Growing Up NYC and collect feedback. Caption: One of our many Growing Up NYC supporters wearing a t-shirt in support. Caption: Former Deputy Mayor of NYC, Richard Buery, reads to children at the Queens Library Spanish Storytime event. Caption: NYC Opportunity employee handing out Generation NYC materials to teens and young adults from the community at the launch event. Caption: Teen Inspiration, Anijah, speaks to NYC youth during the Generation NYC launch event at BAM's Teknopolis exhibit. Both Growing Up NYC and Generation NYC are being quickly adopted by non-profits, schools, local libraries, and City agencies as a resource to spread to their constituency.